Out of all of the films actor Christopher Lloyd has done, he considers his first film as one of his favorites - 1975's "One Flew Over the Cuckoo Nest." "Jack Nicholson is still an idol to me," Lloyd told the crowd gathered Sunday at the Westin O'Hare in Rosemont for this weekend's Official Star Trek Convention. "He just has a daring and crazed approach to what he does." 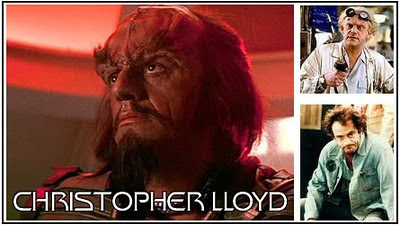 Lloyd, of course, has done his fair share of adventure and science-fiction films, including playing Klingon Commanger Kruge in "Star Trek III: The Search For Spock,"and Doc Brown in the "Back to the Future" movies. The convention offered a bevy of "Star Trek" stars. Leonard Nimoy, unfortunately, had to bow out of his scheduled appearance on Friday because of minor benign abdonimal surgery. He is reported to be recovering well. But those attending the convention did get to pepper Lloyd with questions. And Chase Masterson, who played Leeta in the "Deep Space Nine" TV series, serenaded the crowd with her singing. Read more about what Lloyd had to say, along with my interview with Masterson and a convention-goer. "A lot of people ask me if he was a flake. He wasn't a flake. He was very intelligent. He knew what he wanted to do." "I loved playing Kruge. I never clearly understood why I was cast in the movie. It was such a raw character. I loved wearing all the makeup." "I start thinking about what I want to bring to it. I like putting all the dots together." "It was just something so incredibly enjoyable. It is an evil character that is so bad. It's fun." "I grew up under the spell of Marlon Brando. He was the epitome of a great actor." "There is a new video game coming out. The story line picks up where "Back to the Future III" ended. It looks great." "I'm sure I will be doing more family films. It is inevitable. But I would like to do a real gory horror film." "I rode it about four or five consecutive times and I almost lost my cookies." "It was very strange. We had been filming with Eric Stoltz for six weeks. Stoltz was very good, but you needed an actor that had a comic flare. The chemistry between Michael and I was automatic. It worked out." "I kind of feel "Back to the Future III" was a good time to stop. It might have been risky trying to stretch it to another film." Q - How many conventions do you do a year? It varies. I like doing them because we get to publicize our new projects and raise a lot of money for charity. It's nice to meet the fans, who really make the show possible. Q - Do you like showing off your singing talent? Are people surprised that you can also sing? They usually are somewhat surprised. People are happily surprised. Q - What did you like about your role on "Deep Space Nine?" 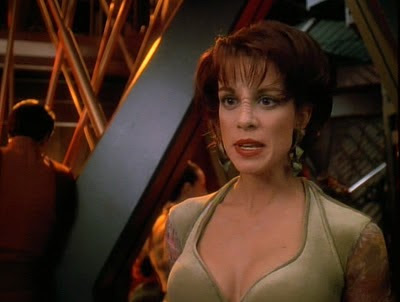 Leeta was a fun role. I liked her conviction that what's important about a person is what is on the inside. She made a lot of great stands as a person. I wish they would have given more depth to the character, but I was able to find a fair amount, I think. It was a lot of fun. Q - It seems like you are concentrating a lot on your singing these days. There's a lot going on with my music, and that's good. Music is something that is possible to be more creative in generally than film and television as an artist, because you don't have to get anyone else's approval. Q -Do you prefer doing one or the other, or do you like both in your life? I like both. I started singing when I was five years old. I could see doing both for the rest of my life. She will be part of the Star Trek Cruise from Dec. 5 to Dec. 12. More information is at www.startrekcruise.com. Interview with convention-goer John Lang, 47, of McHenry, who came to the convention dressed in a captain's uniform. Q - Do you consid yourself a Trekkie or a Trekker? A little of both. I don't dress like this every day. I do have a life outside "Star Trek." I like other stuff besides "Star Trek." Q - What kind of uniform is this? This is from the original series. It's the captain's uniform, the one that Captain Kirk wore. Q - What do you like about "Star Trek?" The message. It's about people getting together from all types of races and religions. They come together for one single purpose, putting all their differences aside, and doing a mission. After sneaking into a club at age 14 to see blues legend Otis Rush, Janiva Magness knew what she wanted to be - a blues singer. The 53-year-old Magness has now been performing for almost 30 years and last year, was awarded the prestigious Blues Music awards for B.B. King Entertainer of the Year - she is only the second woman to ever win the award, the first being the Queen of the Blues Koko Taylor - along with once again being named Contemporary Blues Female Artist of the Year (an honor she also received in 2006 and 2007). She is considered one of the premier blues and R&B singers in the world and has earned rave reviews from the likes of Mavid Staples and Bettye LaVette. Touring in support of her latest album on Chicago-based Alligator Records, "The Devil Is An Angel Too," Magness will perform Friday, Oct. 29, at Old Town School of Folk Music, 4544 N. Lincoln Ave., Chicago. Chicago's own Lil' Ed and the The Blues Imperials also is on the bill. The show starts at 8 p.m., and general admission tickets are $22, $18 for children and seniors, available at www.oldtownschool.org. I had the chance to talk to Magness about a wide range of topics, from how she discovered the blues to reuniting with the daughter she gave up for adoption at age 17. Q - Your touring schedule is jam packed these days. Do you like that? Do you like the constant touring? I like working, and I feel like having time management problems is a quality problem. I got a lot of people that want my attention and time right now, and that's a quality problem to have. Q - Of course, you are touring in support of "The Devil Is An Angel Too." Did you have some goals for the album? What did you have in mind when you sat down to make it? The goal is to always make as good of a recording as I possibly can, and as honest of a recording as I possibly can. It seems very well-received. It debuted at number on iTunes, which is a big deal in today's world. I've been touring more than I ever have in my life. I've done a ton of shows this year, and it looks like 2011 will be another stellar year. People keep turning out heavily for the shows, and in this world, in this economy, that's a blessing. Q - How would you describe your music? Are you blues, are you R&B, are you soul, or are you all of the above? I would say all of the above. I'm definitely a blues artist. But I think contemporary is an accurate description, as opposed to traditional. Q - Do you think that if you hadn't sneaked in to see Otis Rush, that you would be where you are today? I have no idea. What I think happened is that I had a profound spiritual experience when I was a young girl watching Otis Rush. I am ever grateful for that. Q - What was it like watching him? How did that impact you? It was riveting. He took me hostage that day. He took my heart hostage. I connected with that performance in a way that I had not ever connected with another human being. And I really didn't understand what happened at the time. I was 14 years old, come on. All I knew is that when I left that club, whatever that was that I experienced, I needed more of that. I needed more of that thing. So I began to seek that out, that experience of being so deeply connected. Q - Last year, you received the B.B. King Entertainer of the Year award. How did it feel to receive an award like that, let alone being only the second woman to receive the award? It's really dreamy for me. It's very, very much like a dream. I get kind of teary eyed when I think about it. I'm not a person that expects good things. I'm just not hard wired for it. I'm hard wired to work hard, and just keep working. That's what I do. So when profoundly good things happen like that, I'm really shocked. And that was such a huge moment for me. And the fact that B.B. King was actually there last year handing out the awards, and Bonnie Raitt was being his trophy girl was absolutely dreamlike. But I know it happened for sure because there's pictures. Q - Did you ever have the chance to meet Koko Taylor? Oh, yes. I had the great fortune in the last few years to become friends with Koko and her daughter, Cookie. My two greatest influences as an artist are Koko Taylor and Etta James. When things come first circle like that and you are given an opportunity as an artist to actually meet your idols, it's amazing. Q - On your tour, I know you have been talking about foster care a lot. Always. I am an alumni of the foster care system. I step forward for youth at risk in this country. I'm deeply passionate about this topic. It turns out that because someone stepped forward for me when I couldn't stand up for myself, it changed everything. It changed the end of my story. I'm deeply devoted to doing everything I can do to talk about this and to bring it into the light, and to encourage and inspire people to step forward for youth at risk. It doesn't really matter how much time you have. There is something you can do to help change a child's life. Q - I know you were a teenage mom and gave your child up for adoption. Have you tried to find her? We are completely reunited, which is a huge blessing. That happened when she was 16 years old. I really feel like I'm the luckiest woman alive. Ultimately, her family invited me to her high school graduation, which was the next time I saw her. The last time I saw her, she was four months old, and the next time I saw her she was graduating from high school. And now we are like the Patty Duke twins. It's pretty intense. It's great. Q - Does she want to get involved in music? She's an amazing singer. She has a great set of pipes. Q - Have you considered doing a duet together? We've done some stuff on stage. I talk to her three times a week. We're like really tight, I guess that's the term. Q - You've been doing this for a while. Do you have any dream collaborations? I would love to have an opportunity to collaborate with B.B. King, or Dr. John. That would be great fun. Hell, I would love to play a show with Eric Clapton, or Buddy Guy. I love Buddy. Q - Have you been to Buddy Guy's new club? Q - Maybe you can do that when you're in Chicago. I have played the old club several times. I look forward to checking out Buddy's new place. St. Charles native and former "American Idol" contestant Leslie Hunt continues to explore new musical horizons. These days, Hunt is fronting Chicago progressive rock band District 97, www.district97.net, a group that is catching attention world wide. Hunt will return to her hometown Friday, Oct. 22, when District 97 performs at Chord On Blues, 106 S. 1st Ave., St. Charles, www.myspace.com/chordonblues, for a CD release show to mark the release of "Hybrid Child." The all-ages show starts at 8 p.m. and there is a $5 cover charge. The show is all ages until 11 p.m. Blane Fonda is also on the bill. District 97 will also perform Nov. 19 at Martyrs, 3855 N. Lincoln Ave, Chicago, and will open for Dream Theater frontman James Labrie on Dec. 7 at Reggie's Rock Club, 2105 S. State St., Chicago. I had the chance to catch up with Hunt on her latest activities, which also include being a single mother to 14-month-old Eliza. Q - Some people might be surprised that you are fronting a prog rock band these days. How did you decide this would be a good fit for you? I heard the music when I opened up for them a few years back, and I loved it. I loved the energy and how complex everything was. I think that my vocals fit in nicely. I don't think it is a long shot at all. Q - Did you grow up listening to bands like District 97? Not bands exactly like that, but I grew up on stuff that is musically not in the mainstream. I wasn't just fed pop music as a child. My dad is a free jazz musician, and he exposed me to a lot of avant-garde styles. Q - You kind of have a jazz background. Do you think that's why it fits? Yeah. You have to have an appreciation for music which is that colorful. I would definitely say that has something to do with my involvement with the band. Q - Which do you prefer, being solo or in a band? I'm kind of enjoying being in a band. There's not so much pressure on me, and I can be a mom. When it's just you and you are driving the whole ship, there's really no down time. Q - How do you manage juggling a family and being in a band? It's actually not that bad, because Jonathan's mother babysits for me when I have to go to band practice. (Jonathan Schang is the drummer and the bandleader for District 97). It's just me and Eliza here and my dog. Luckily I have a big support system, which is great. Q - What do you think sets District 97 apart from other bands? I would say our energy. Our live show is really impressive. I'm continually so impressed with the band that I am in, and people are absolutely just blown away by our show. It's really cool to be part of something that catches people's attention like that. The compositions are really great. I'm writing a lot of lyrics now for the band, so our next record will have a lot more of my lyrics on them. I only wrote one set of lyrics for this record, and everything else Jonathan wrote. It's a really fun outlet for me to just write lyrics, over such cool melodies these guys are writing. Q - Now you are not performing your own music these days, are you? We do a couple of songs from my album that came out last year. We do "Open Your Eyes" and "Sea I Provide" in a District 97 style. Q - What do you think that did to the songs? I think it just made the songs a little harder. It's fun to experience those songs in a different light. Q - Do you ever get tired of being referred to as a former "American Idol" contestant? It was a part of my life and it will definitely always be part of my story. It doesn't really bother me yet. Q - Have you watched the show since you were on? No, not even a single episode. Q - I was going to ask you about Lee DeWyze. I have no idea who that is. I have nothing against the show, I just don't watch it. I don't really watch that much TV. If I do, it's like "Dexter." Q - You are also a vocal producer and coach. It seems like you enjoy doing a variety of things. I don't always want to be performing live. I don't always want to be in the studio. My ideal life would be music experienced in a bunch of different ways. The first national tour of "Billy Elliot the Musical" will come to a close in Chicago on Nov. 28 at the Ford Center for the Performing Arts, Oriental Theatre (24 W. Randolph Street). “On behalf of my fellow producers and the entire production team, I am grateful to the wonderful city for welcoming our show. We appreciate the opportunity to have shared "Billy Elliot" with the seasoned theatergoers of Chicago,” said Eric Fellner, a producer of the show. 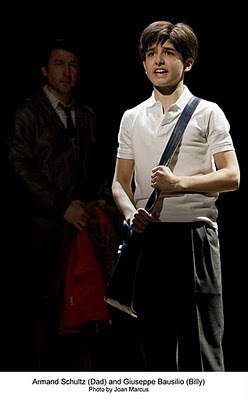 After 37 weeks and 288 performances, the first national tour of "Billy Elliot" will leave Chicago and will next be presented in Toronto, beginning Jan. 29, 2011, followed by the San Francisco engagement, where performances will begin on Sept. 13, 2011. Tickets are on sale now for the final six weeks. Individual tickets range in price from $30 to $100. A select number of premium seats are also available. Patrons who have purchased tickets for performances after Nov. 28 should contact their point of purchase. Tickets are available at all Broadway In Chicago Box Offices (24 W. Randolph St., 151 W. Randolph St. and 18 W. Monroe St.), the Broadway In Chicago Ticket Line at (800) 7752000, all Ticketmaster retail locations (including Hot Tix and select Carson Pirie Scott, Coconuts and fye stores), and online at www.BroadwayInChicago.com. Comedian, dancer and musician Margaret Cho has already dusted herself off and is ready for her next project after getting eliminated from "Dancing with the Stars" this week. Cho will perform Oct. 16 at The Chicago Theatre, 175 N. State St., Chicago, as part of her nationwide Cho Dependent tour. The show starts at 8 p.m., and tickets range in price from $39.21 to $76.66, available through www.ticketmaster.com. I had the chance to do an e-mail interview with Cho and got caught up on all her recent activities, including the release of her first album. Q - You were eliminated from "Dancing with the Stars" this week. Do you think the judges were too hard on you? What made you want to do the show in the first place? I love dancing, and so I wanted to do the show. It's so glitzy and glamorous and I had an amazing time. The judges were hard on me because they could see that I was a good dancer and they commented on this fact every time I danced. I respected all of their opinions very much and had the time of my life on the dance floor. Q - Any advice for the remaining contestants? Given your disdain for Sarah Palin, did you have any awkward encounters with Bristol Palin? Bristol was really supportive and awesome and we were good friends for the entire run. I would tell all the other contestants to dance like no one is watching - even though many millions of people are watching. Q - You and your dance partner chose the theme of gay pride in dancing the samba the other night. Do you think the judges understood what you were trying to do? I think the judges understood it, and I think that this was a fantastic dance routine with a wonderful message. It was the best thing ever. Q - Tyler Clementi killed himself after his classmates outed him. What can be done to stop bullying? I think that talking about what happened, breaking the silence, talking about the problems lgbt youth face every day. 90% of gay and lesbian teens are bullied and this needs to be talked about in order to stop it from happening any more. Q - You have said you were bullied growing up. How did you deal with it? Do you think bullying is worse these days? I dealt with it by growing up faster than I would have - which isn't a bad thing, although I missed out on a lot of my childhood because I was trying to get away from people who were tormenting me. I would say bullying is worse today in that there is so much social networking - a whole new arena where attacks can happen. Q - You have always been open about your sexuality, and your battles with alcohol and drugs. What do you think your experiences can teach people? I hope to help people deal with their darkness and their truth and not feel alone in their battles. To be able to deal with problems with humor has a grace that goes beyond anything else. Q- After your experience on "All-American Girl," what made you want to do "Drop Dead Diva?'' What do you like about your role on the show? I love "Drop Dead Diva" because of the message - love yourself and accept yourself - which is the best thing to say. And it's a great role - hilarious and wonderfully written. Q - When did you first discover you could sing? What was the impetus in making "Cho Dependent?" Do you see yourself making more albums? I do want to make more albums. Cyndi Lauper told me I could sing when we went on the "True Colors" tour - and I believed her. I wanted to make an album that was comedy songs but with truly beautiful inspired melodies. i am very proud of my accomplishment. Q - You collaborate with an eclectic group of artists on the album. How did you go about choosing the artists on the album? Some people i knew well, like Jon Brion and Grant Lee Phillips. Others I got to know in the process, like Andrew Bird and Rachael Yamagata. Everyone was brilliant. Q - I understand you try to address the issue of domestic abuse in the song "I'm Sorry." Explain the background behind the song. My first crush was with one of the writers of "All American Girl." He didn't like me back at all, and it was heartbreaking, yet I never let go of loving him. Many years later, after holding him as an ideal person in my heart, I had learned that he very gruesomely murdered his wife. It was so horrible I didn't know how to deal with it except approach the topic using dark humor. It's a beautiful song, but it also breaks my heart when I sing it, but sometimes the only way to understand the darkness of life is to write about it in the only way you know how. Q - You have said that you admire Madonna's guitar shredding. What do you think of your own guitar playing? I am a good player - which amazes me still. I am a folky acoustic musician - not like Madonna who plays electric so great! Q - With the album, are you trying to bring back musical comedy? Which is harder, being on stage doing stand-up comedy, or being a musician on stage? I love musical comedy - but I still think stand-up comedy is harder, although there is also the physical skill of playing and singing that you have to master - but stand-up is the hardest. show up as guests on the tour? I will sing a little on the tour - but it's still a stand up comedy show. I feel that is who I am - who I will always be. Some different artists will come and play - Garrison Starr has joined me on several dates, and Ben Lee and Grant Lee Phillips will also come and play too. Q - Are you offended that Mel Gibson hasn't said anything bad about Asian people? Yeah we are totally left out by him. state of stand-up comedy these days? I love Chelsea - and I hope that I have helped all female and Asian comics get a break in comedy. I love that I still get to do it and that I am having fun doing it. Stand-up comedy is enjoying a real renaissance - It's everywhere! I am looking forward to another season of "Drop Dead Diva" as well as recording my next album! A few links to stories about John Lennon on what would have been his 70th birthday. You never know who is looking at your MySpace page. New York musician Julian Velard was struggling to get his music out when EMI heard his music on MySpace and signed him. Velard, who now divides his time between New York and London, will perform Oct. 16 at Schubas, 3159 N. Southport Ave., Chicago. Julia Klee also is on the bill. The show starts at 7 p.m., and tickets are $8 in advance, $10 at the door, available at www.schubas.com. I had the chance to talk to Velard about his musical ambitions and influences. Q - Being in London, does that offer more opportunities? signed by EMI over in England. say that New York is the center of the music industry in America? Probably not. That's more in L.A., or Nashville. London is a smaller pond, but it's a bigger platform. Q - How is the music scene different? year. They'll pick 10 acts and say, these are the acts you should look for. melodies. The European audiences are way receptive to that. got their first wave of success in England. until they make it in America. And three weeks is pushing it.You could probably do it in two and a half weeks. done, you are ready to go back on the road. It's almost like England in a way is a state. It's like a big state. Q- EMI discovered you through MySpace. Did you ever have any idea that a label would listen to your songs on MySpace and sign you? I was hoping. I was hoping for that. It was a crazy situation. That was really the third record I made on my own. It was kind of like my last shot. I made this EP called, "The Movies Without You." I borrowed money from my dad. I had this insane credit card bill, and I owed my landlord money, and I had school loans. I knew when I put that record up there that if I didn't figure this out in the next six months or so, I would really have to get a job and become a normal human being. I got very lucky. I made a record that I was really proud of, and somehow people heard about it. It got out there and caught a buzz. Q - How long were you juggling being a gym teacher and trying to launch your music career? I taught for four years. I was waiting tables too. People would also hire me to write songs, like, "Hey, can you write a song for my play? I have these lyrics. Here's $500." Basically, I was just doing anything just to pay the rent and make a buck. I've been pretty much doing only music for the last four or five years. I've been very lucky. Q - I understand you also have a passion for movies. How do you think that finds its way into your music? I'm into narrative songwriting, and I really picture things when I'm writing. This new record, "Mr. Saturday Night," is even more the case. I basically wrote the entire record from a character's perspective. Q - Like a concept album? It's kind of like a concept album. There's a continuity in all of the songs. There's a character I developed, "Mr. Saturday Night," who is singing all the songs. It's playful. I'm much more inspired to write from someone who is not me. You get tired of just dealing with your emotions all day. I see this guy in this new record like a character in a movie. As a result, live, I'm dressing differently than I normally would. I've got kind of a whole shtick that I'm doing live with this new stuff. Q - So you are putting a little Elton John into your act. A little bit. I'm not taking it so far and putting on a glitter suit or anything like that. The vision I have for this character is sort of like this '50s or '60s stand-up comedian supper club guy. He's kind of seen it all. It's kind of like my stage persona, but I think I took it the next step, and went a little further with it. I see him as a mix between Lenny Bruce and Pepe Le Pew, an overly romantic, very sarcastic, dark person. We will see how that translates on stage. I'm still figuring it out, really. Q - Of course, given the title of the record, people might expect Billy Crystal to show up. I know. Well, if we're lucky, maybe he'll sue me for copyright infringement. Although I don't think you can sue somebody for a title. We'll see how many people remember the Billy Crystal movie. Apparently it wasn't very successful. Nobody saw it. I think I would have a lot harder time naming my record, "Jurassic Park." Or "Titanic." Han Solo, which surprised me. Fairbanks sense of the word. Q - Growing up, who would you count as your main influences? are forced fed that stuff. older, I thought he was a huge cheeseball and got off it. newer stuff, I'm wearing my influences much more on my sleeve. Guys like Billy Joel and Elton John were huge influences. I'm a massive Dylan fan, and a massive Beatles fan. But then Stevie Wonder is also a huge influence on me, and Elvis Costello is a huge influence. If I look at someone whose career I marvel at, it's Harry Nilsson. He was able to have hits with his own songs, and hits covering other people's songs. He did a record of just covering Randy Newman songs. I've love to have a career like that. I'm coming very much out of a songwriting thing. That's the stuff I was weened on. The '70s really produced the hallmark of great writing, great playing and great recording. Recorded music was sort of at its height then. Animal expert Jack Hanna does plenty of clowning around during his regular appearances on the "Late Show with David Letterman." He uses humor to draw attention to the serious message of wildlife conservation. Hanna will bring his live show Saturday, Sept. 9, to the Paramount Theatre, 23 E. Galena Boulevard, Aurora, www.paramountaurora.com. 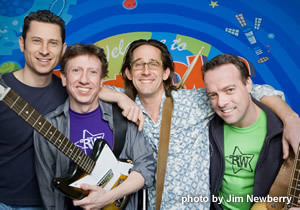 The show starts at 4 p.m., and tickets are $29.50, available online at www.ticketmaster.com. Hanna will have several animals with him as part of his Aurora appearance, including a cheetah, lynx, flamingo, armadillo, wallaby, Burmese python, gator, lemur, barred owl, toad, tamandua, coatimundi, grey fox, sloth, groundhog, and fennec fox. I had the chance to Hanna about his work prior to his Paramount Theatre appearance. Q - I know you are going to bring a number of animals to the Paramount. How do you choose what animals to bring to your appearances? They are coming from the Columbus Zoo (in Columbus, Ohio) because of how close it is to Columbus. The animals never travel more than 10 hours wherever I go. During the show, I talk about my background, and kids ask me how I got started. And then I'll show a video about me going to see the mountain gorillas in Rwanda. I've been going to Rwanda since 1982. I'm going to show them how I'm taking my family up to see the mountain gorillas. People come not just to see Jack Hanna. I tell stories about what I've done, and crazy things that have happened to me. Q - This past summer, I understand you had to fend off a grizzly bear with pepper spray, and then you were talking about it with David Letterman on his show recently. Are your eyes still stinging after he sprayed you? He took it and shot it right in my face. It burnt the side of my face. I couldn't shave for almost three days. But I've been hurt worse than that. Q - It looks like you are really having fun in your appearances on the show. Why do you think the relationship works? I really don't know. I know he loves animals. He has a ranch in Montana right across the mountains from me. But we don't see each other socially. It's just a show, and that's the way I want to keep it. That's why it works, the way he and I treat each other. But people who might not know much about animals take away something from that show. Even though it is fun, I make sure that somebody takes some knowledge away from the show. There's never a rehearsal before the show. We just go off the cuff. He only knows the animals I'm bringing, and sometimes he doesn't even know that because I surprise him. It's that my personality and his just mix, I don't know. Q - What do you see as your mission? To educate people in a fun way. The animals are treated with respect. I don't care about me. The animals are treated with respect on Letterman, not me. These animals are ambassadors of their cousins in the wild. All I'm trying to do is educate folks about the animal world. When you visit a zoo, you go to have fun with your family. But when you leave the zoo, you know something. How are you going to save something unless you love something? That's what a zoo does. It teaches you a love for creatures. It teaches you to respect these animals. That's what I try to do on my shows. Q - Is educating children one of your big missions? Education is the number one priority of a zoo. You can't have conservation unless you are educated. We have to educate the younger generation. My generation did terrible. Baby boomers caused more damage to the planet than any previous generation on Earth. Q - I grew up watching "Wild Kingdom" with Marlin Perkins. Do you see yourself trying to fill his shoes? Marlin Perkins was my hero. I used to watch him like you did. That was the first animal show on TV. It's not a matter of me following anybody. I just happened to do it. I never dreamed about even being a zookeeper, much less being a television ambassador for animals. I don't like the word celebrity. I don't like the word star. I don't use those words. I'm still the same person I was on our farm in Tennessee as a little boy. Q - Are there any new projects you are working on? I just got back from South Africa and Rwanda where we were filming. Then in three weeks, I leave for the Amazon River. I take a boat down the Amazon filming the pink river dolphin. Then we take off for Patagonia in Chile. We will film way up in the mountains the Andean Condors, a very rare bird. They are the largest flying bird in the world. Q - Is that the way you like it, just keeping busy all the time? I like it because I love what I do. My dad taught me about hard work and enthusiasm. He told me, "Jack, if you work hard and love what you do, you'll succeed." That's my problem. I run myself into the ground because I love everything I do.